Agatha Pantha, eighty-two, has not left her house -- or spoken to another human being -- since she was widowed seven years ago. She fills the silence by yelling at passersby, watching loud static on TV, and maintaining a strict daily schedule. Karl the Touch Typist, eighty-seven, once used his fingers to type out love notes on his wife's skin. Now that she's gone, he types his words out into the air as he speaks. Karl's been committed to a nursing home, but in a moment of clarity and joy, he escapes. Now he's on the lam. 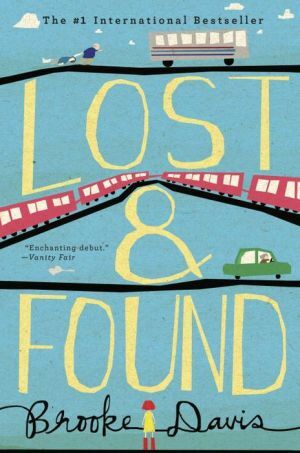 Lost and Found is the first novel by Australian author, Brooke Davis. Seven-year-old Millie Bird has been keeping a list of Dead Things, but when she has to add her Dad to the list, she finds people are reluctant to answer her questions about death. Then her mother tells her to wait beside the Ginormous Ladies Underwear stand in the department store and doesn’t return. By the Second Night of Waiting, she has already encountered Karl the Touch Typist, escapee from a Nursing Home, and been saved from the Security Guard by Manny the Mannequin. Millie’s getaway from the store sees the eighty-seven year-old widower (and Manny) subjected to stern disapproval at the Police Station. Meanwhile, reclusive widow, Agatha Pantha, known for her critical insults shouted at all who pass nearby, is moved to leave her house for the first time in seven years as she becomes aware of the young girl’s plight. What ensues in the quest to find Millie’s mother is an escapade involving a bus trip, a journey on the Indian Pacific, a stolen car, a desert trek, a pub brawl, Super Heroes and encounters with people who are variously surly, helpful, obstructive and occasionally dangerous. Davis paints some marvellous word pictures: “A white ute roars along a dirt road half a mile away, dust spraying behind it as though it’s waterskiing in a red lake” and “There’s a music to her snores, surely, in their rise and fall, an indication of how life works, in its ups and downs. He wants to graph the sound, and imagines mountains on a page, wide, curvy ones, rippled lines” and “Karl always felt as if he was thudding everywhere next to her, crunching leaves underfoot with such violence, sneezing as though he was trying to put a tear in the air” all demonstrate her skill with words. Despite the fact that the ending seems a bit rushed, leaving a somewhat unfinished feel, this is a moving novel that will have the reader thinking about love and loss and grief. Millie gets the final word: “… you should be able to hug all the mums who aren’t yours, because some people don’t have mums and what are they supposed to do with all the hugs they have?” An outstanding debut.